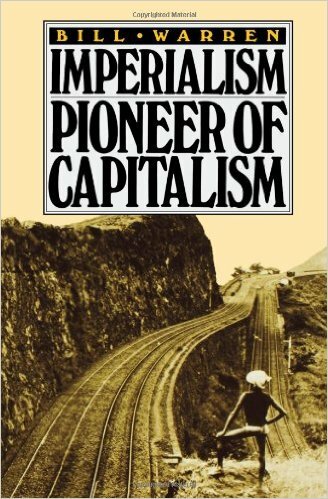 REFUTING ‘ANTI IMPERIALIST’ MYTHS: A Review of Bill Warren’s Imperialism, Pioneer of Capitalism. This article by David McMullen was originally published in September 1993 in the journal “Red Politics”.There was also discussion of the review at the lastsuperpower site in 2006. And secondly, he is so busy extolling the historical mission of capitalism, that no effort is devoted to discussing how capitalism is an obstacle to human development and is becoming increasingly obsolete. Neverthelsee, despite these shortcomings it is the myth shattering quality of the book that predominates. (1) Increased economic concentration and the destruction of the petty bourgeoisie. A classic case of the left’s response is its bemoaning such things as agribusiness, supermarkets and fastfood chains. On the destruction side, they broke up or seriously undermined much of the existing social fabric and pre- capitalist modes of production. On the construction side, political unity was greatly enhanced by the British sword (mainly in the hands of local recruits), telegraph and railways, and embryonic industrialization began to emerge. (b) The ‘traditional’ division of labor between centre and periphery countries whereby the former produce manufactured goods and the latter primary goods, is seen to be imposed by the centre on the periphery and is a source of its backwardness. (c) Imperialism or centre/periphery relations are said to encourage the preservation of precapitalist modes of production. This is discussed at two levels. First, there is the case where capitalist production at one point encourages pre-capitalist production at another point (eg, cotton production based on slavery). Here Warren correctly argues that the destructive force of capitalist relations would far outweigh any conserving tendencies. There is also the concept of articulated economy. Every country has to have its own steel industry, for example. It is argued that if you do not have the full range of industries you are trapped into some narrow and enslaving international division of labor. In Warren’s opinion, the more recent theories of imperialism, such as underdevelopment and dependency are best regarded as post-war versions of the views expressed by Lenin in Imperialism, the Highest Stage of Capitalism,or at any rate stemming, or continuing, from where he left off. Warren also claimed that in this book Lenin was espousing views that were at variance with his earlier writings on the Narodniks and the role of capitalist development in Russia.